As I write this the long and apparently tech-savvy hands of the Chinese Communist Party (CCP) are busy making sure that no news of the great mass uprisings taking place around the world gets through the Great Firewall. 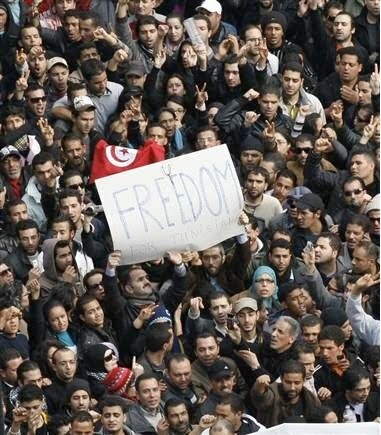 In the first weeks of 2011 a grassroots revolution in Tunisia [Tunisians prefer calling it the Jasmine Revolution] led to the overthrow of Ben Ali, the dictatorial president who ruled the country for 23 years. Not satisfied with a hastily-formed transitional government, people are demanding a completely new administration free from any trace of autocracy. In the same continent, hundreds of thousands of protesters are taking to the streets in Cairo, Egypt, demanding Hosni Mubarak to step down. Mubarak has been ruling the country with an iron-fist for over 30 years. Just across the Red Sea from Egypt, another uprising is taking place in Yemen. The opposition leaders and students have joined the activists to rally against their corrupt president, Ali Abdullah Saleh. Saleh has been ruling Yemen dictatorially since 1978.